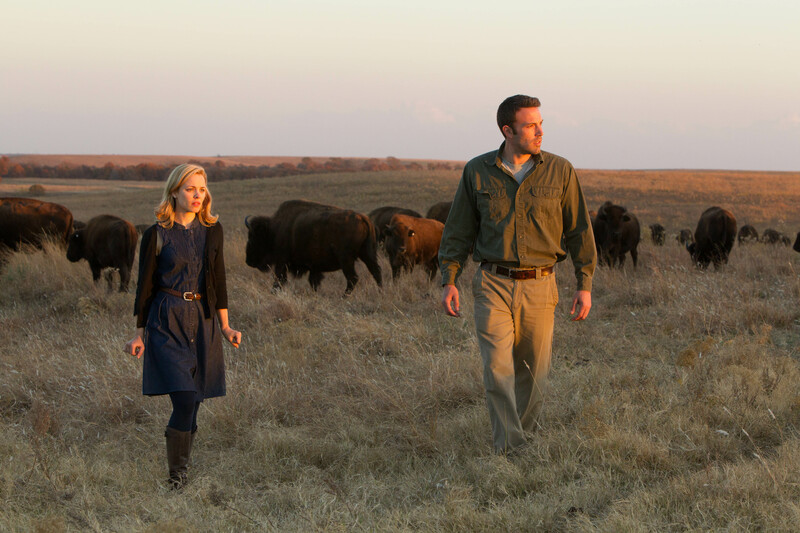 I could’ve done without the “the” in Terrence Malick’s latest cinematic symphony To the Wonder. and love in war (The Thin Red Line)…to wonder what it was like to discover a new land, a new love, a new way of life (The New World)…to wonder about the beginning and end of time and the loss of a loved one (The Tree of Life). To the Wonder is a meditation on loneliness. The loneliness of a French woman in Oklahoma (Olga Kurylenko – picture perfect and boiling beneath the beautiful seams) brought to the States by her vapid American lover (an obnoxiously cast and clueless Ben Affleck). But wait…the vapid Abercrombie beefcake who stole the heart of this French beauty is lonely too…wistful for a lost love (the never more beautiful Rachel McAdams, wonderfully subdued and lovingly photographed)…and she is lonely herself because she lost a baby girl. And then there’s the Spanish-speaking priest (Javier Bardem, appearing as if he was exorcised from the long-lost film translation of Graham Greene’s The Power and the Glory) lost in an epic white trash fantasia attempting to heal the community while questioning his faith and place in this world. Malick and cinematographer extraordinaire Emmanuel Lubezki find beauty in the white noise of life…whether it’s the streets of Paris or the industrialized rural mecca of Midwestern America…the film is lost is the loneliness of beautiful everyday spaces. In Malick’s world the grass is always so high…the light so perfect…the loneliness and beauty of it so all-encompassing. His camera is so fluid…as every film he’s ever filmed reminds us with images of water flowing over rocks and sand and time…and time passes in To the Wonder. It’s a wonder it ever finishes…because as the music and imagery wash over you like that water over the rocks and the sands…you find yourself stuck…wondering…what does it all mean? In To the Wonder people fill their loneliness with affairs…children…religion. The holes in their hearts are so big it empties entire homes…communities. Indeed, Roger…you, on your death-bed…one master “apologizing” for another…you got it. 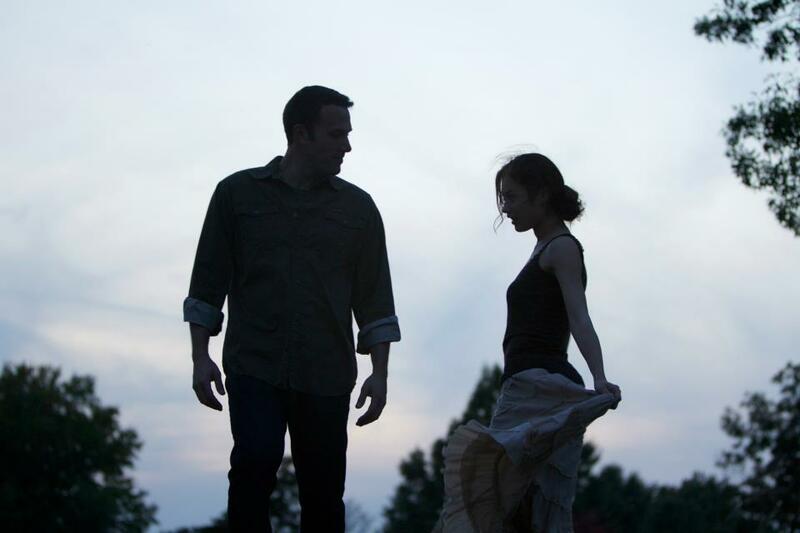 Malick when left to his own devices will produce a symphony whether you like it or not. In Olga Kurylenko…a Russian model turned Bond girl turned actress playing a French woman lost in Oklahoma…he found a singer for the ages. Don’t muffle her voice with you preconceptions. Don’t silence a master who has painted a portrait of loneliness only the coldest of hearts couldn’t find solace in. Do you have to be on your death-bed to wonder about the beauty of art…of life? I hope not. For if so, then we are in a darker place than even Malick could imagine. One would be remiss not to read Roger Ebert’s swan song. Over at They Live by Night, the film is compared to a ballet. This entry was posted in Art, Art-house Cinema, Inspiration, Movie Reviews, Movies and tagged Ben Affleck, Emmanuel Lubezki, France, Javier Bardem, Lonliness, Love Affairs, Oklahoma, Olga Kurylenko, Rachel McAdams, Religion, Roger Ebert, Terrence Malick, To The Wonder. Much like the fluidity of his camera, my feelings on Malick’s films are often fluid and change over time. To the Wonder deserves multiple views to truly rate in comparison with the others, but my first thought is it would be an 8/10 (though it contained “feelings” which are beyond rating). I so agree with you about the fluid nature of our feelings for Malick’s cinema. It was not until I saw The New World that I felt more deeply attached to The Tree of Life. And although I haven’t visited all of Malick’s works, it’s impossible for me, at this point, to rate any of his films below 10. It’s a 10/10 for me all the way for The New World, The Tree of Life, The Thin Red Line, and Days of Heaven. Nice closure to your review with Roger’s immortal words. Prakash – sounds like the only one you’ve missed is Badlands (and this one, of course). It almost seems silly to try and rate or grade Malick’s films, for me their only competition/comparison is each other as Malick operates in a zone beyond standard cinema. Even his slightest films (To the Wonder) carry with them a multitude of thoughts, moments, and feelings. It sounds cliche (and maybe pretentious) but watching his films is more like going to a museum and looking at art. Yet the totality of his visions could only be captured on film. David you really do a great job framing this ravishing film, one that I do believe will get better and better on repeat viewings. I like the assertion that it’s a “meditation on loneliness” but I also see the film as a symphony as well. This is a meditative tale of spiritual inquiry, one where romantic and Christian devotion converge in an impressionist and rapturous film that is conveys a smoldering anxiety and fleeting ecstasy through faces and vistas evoking a style Malick has certainly used before, but one that in another sense opens new windows. Arco Part, Wagner, Berlioz, Tchaikovsky give Malick’s vision defining aural majesty and allow for what might be termed an an emotional epiphany. I like your statement about the film capturing smoldering anxiety AND fleeting ecstasy – that can relate to both a romantic moment OR a religious experience. That was me above David. Ha! A Review of Ron Rash's "Serena"